In the nearly 40 years since George Lucas first introduced audiences to his galaxy far, far away, plot holes have become as much a part of the Star Wars universe as droids and lightsabers. Fortunately, there have been plenty of fans willing to step in with their own theories to fill in the missing storylines, and sometimes imagine new ones altogether. Here are 9 outrageous fan theories about Star Wars. 1. PALPATINE IS ANAKIN SKYWALKER’S FATHER. In The Phantom Menace, George Lucas introduced Midi-chlorians to the Star Wars universe. Midi-chlorians are microscopic life forms that live within the cells of every living thing and are gateways to the Force. Lucas also introduced the idea that Anakin Skywalker didn’t have a father, but rather was conceived by the Force, which is why he had the highest Midi-chlorian count of any living being. So who was Anakin’s real father? 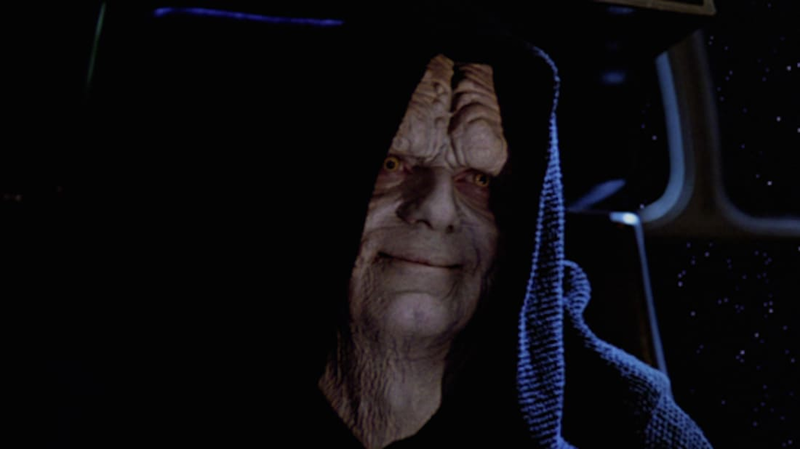 There are pockets of Star Wars fans who theorize that Palpatine (a.k.a. Darth Sidious) fathered Anakin through the Force. In Revenge of the Sith, Palpatine (Ian McDiarmid) tells Anakin about the tragedy of Darth Plagueis, a Sith Lord who had the power to manipulate Midi-chlorians to create life. Plagueis taught Palpatine everything he knew about the Dark Side, and the belief is that Palpatine used that knowledge to create Anakin because he needed a new apprentice to join—and destroy—the Jedi Knights. 2. BOBA FETT KILLED UNCLE OWEN AND AUNT BERU. Few people die in a more horrific way in all of Star Wars than Uncle Owen and Aunt Beru. When Luke Skywalker (Mark Hamill) returns to his homestead at the beginning of A New Hope, he finds it completely torched with the smoky and burnt bodies of his late aunt and uncle waiting for him outside. While it is believed that Stormtroopers burned the couple alive, a fan theory suggests that it was Boba Fett who did the deed. Thanks to the original trilogy’s Special Editions (which are now considered canon), we know that Boba Fett was on Tatooine with Jabba the Hutt at the time of their death. We also know that the Empire uses bounty hunters to help find people all over the galaxy, as seen in The Empire Strikes Back. In the film, Darth Vader emphasizes that he wants Han Solo alive and explicitly tells Boba Fett, “No disintegrations!” It’s almost as if Vader was telling him not to disintegrate or vaporize people again. 3. QUI-GON JINN IS A SECRET SITH. When Jinn presented young Anakin Skywalker to the Jedi Council, Master Yoda saw a lot of darkness in the boy and refused to train him as a Jedi. Jinn, however, was quite adamant in training young Anakin—going so far as to take him on as an apprentice, even though he already had Obi-Wan. Clearly, teaching Anakin the Jedi ways turned out to be a terrible idea, as it ended with him turning to the Dark Side of the Force, becoming Darth Vader, and ending the Galactic Republic altogether. Yet Jinn insisted the boy become a Jedi. Additionally, Jinn’s own Jedi Master, Count Dooku (Christopher Lee), turned out to be a Sith Lord. 4. CHEWBACCA AND R2-D2 ARE SECRET REBEL AGENTS. At the end of Revenge of the Sith, C-3PO’s memory is erased. Going into A New Hope, he knows nothing about the events in the first three “Episode” films. However, R2-D2 didn’t have its memory erased. It is believed that R2-D2 was working with Obi-Wan (Alec Guinness) as a secret agent to ensure the Rebels obtain the plans for the Death Star at the beginning of A New Hope. Some fans also believe that Chewbacca was another secret agent for the Rebel Alliance. He also helped ensure that Han Solo (Harrison Ford) would be at the Mos Eisley Cantina to meet with Obi-Wan and Luke Skywalker. As the theory goes, Chewbacca was a high-ranking general for the Wookiee Army in the Battle of Kashyyyk during The Clone Wars. He was also one of Yoda’s closest friends and continued to work deep undercover for the Rebels after Revenge of the Sith. In A New Hope, R2-D2 and Chewbacca are also the two characters who know more about the Rebellion and the Galactic Empire than Luke Skywalker and Han Solo. 5. DARTH VADER WOULD NEVER RETURN TO TATOOINE. At the end of Revenge of the Sith, Obi-Wan separates Anakin and Padmé Amidala’s twin son and daughter to hide them from the Galactic Empire and Darth Vader. Princess Leia went to Alderaan, while Luke was sent to live with his aunt and uncle on Tatooine. Some people believe that Tatooine was a poor hiding place, as it was Darth Vader’s home. Why wouldn’t he come back to his home planet to search for his long lost son? However, there are other fans who believe that Tatooine was the perfect place to hide Luke because Darth Vader (a.k.a. Anakin Skywalker) hated his home world and would never return. Throughout the Star Wars prequels, Anakin wanted nothing more than to leave Tatooine because it was full of bad childhood memories. Tatooine is where he was raised as a slave, where his mother died, and where he murdered a tribe of Tusken Raiders. He also hates sand because it’s “coarse and rough and irritating and it gets everywhere.” There’s no way Darth Vader would ever return to Tatooine to confront his childhood trauma after he joined the Dark Side of the Force. Sith Lords always take the easy way in life. Return of the Jedi introduced the Ewoks, a primitive race of cute and cuddly teddy bear-like humanoids from the forest moon of Endor. While they might appear kind and gentle, the Ewoks are evil killing machines. When we’re introduced to them in Episode VI, the Ewoks capture Luke and Han—then hogtie the members of the Rebel Alliance in the hopes of cooking them for a feast in honor of C-3PO, who they believe is their golden god. Simply put: Ewoks eat humans, which is a detail most people seem to forget. At the end of Return of the Jedi, the Rebels and the Ewoks celebrate the end of the Galactic Empire after the second Death Star is destroyed and Emperor Palpatine is killed. During the celebration, we see an Ewok using a few Stormtrooper helmets as a percussion instrument. What happened to the people inside that Stormtrooper armor? Some fans believe that the celebration is not just for the end of the Galactic Empire, but a party to celebrate the bounty of fresh human meat (courtesy of the Empire) for the Ewoks. You’ll never watch the end of Return of the Jedi the same way ever again with that theory in mind. 7. STAR WARS TAKES PLACE IN OUR GALAXY. Despite the opening line “A long time ago in a galaxy far, far away,” there are many fans who believe that Star Wars takes place in our galaxy. The evidence for this claim comes from the appearance of the Asogian alien species in a senate hearing during The Phantom Menace. E.T. the Extra-Terrestrial is an Asogian, which means that Star Wars and E.T. are connected. Additionally, there’s a direct reference to Star Wars in E.T. during the trick or treating scene, when the displaced alien spots a kid dressed as Yoda and says “Home.” Although the scene is a very clever joke, many fans point to the two films as proof that Star Wars takes place in our galaxy. 8. EMPEROR PALPATINE KILLED PADMÉ. At the end of Revenge of the Sith, Padmé Amidala (Natalie Portman) tragically dies shortly after giving birth to Luke and Leia. The droids that attended to her explained that “medically she’s fine but for reasons we can’t explain we’re losing her” and that she “lost the will to live.” Although this explanation is cheesy, there are many fans who believe that Palpatine used the Force to steal her life force, thus ensuring that Anakin would turn to the Dark Side and become Darth Vader. This would also explain why the droids have no idea why she’s dying, despite her being “medically fine.” Furthermore, Padmé’s death and Anakin’s rebirth as Darth Vader are juxtaposed, suggesting that the Force is connecting the two events. 9. HAN SOLO USED THE FORCE. Throughout the original trilogy, Han Solo escapes near-death situations time and time again. There’s a fan theory out there that perfectly explains why Han is able to get out of tough situations with only a handsome grin and shrug to show for it: Simply put, he has the power to use the Force. How else could he successfully navigate through a dangerous asteroid field with only 3720 to 1 odds of survival? He used the Force without even knowing it. Fan theorists also point to Han Solo and Greedo’s notorious encounter in the Cantina in A New Hope. Since the Special Edition is now officially canon, we can see Han quickly move his head to avoid Greedo’s laser blast and then shoot him about a half-second later. It’s the kind of quick reflex that we’ve only ever seen from Jedi Knights. It is believed that Lucas specifically changed this detail from the original Star Wars to clue viewers in to the idea that Han Solo can also use the Force.